"Golf watches are going to die - their days are numbered. The smartwatch has been a gamechanger." That's the opening gambit of Anthony Douglas, founder of Lisbon-based Hole19 - a golf app, which is taking the App Store by storm. After launching in April 2014, the company has now tracked 3 million rounds of golf from 800,000 worldwide users. Hole19 originally launched on the iPhone but it's quickly amassed a loyal following on the Apple Watch. It's amassed 28,000 Apple Watch users since the smartwatch's launch last year, compared to a fairly paltry 8,000 Android Wear users and just 2,000 Tizen ones. "Our mission is connecting the world of golf. It started as a single iOS app. But when wearables hit the mainstream, we saw the opportunity. We were working on Apple Watch a long time before launch. And we wanted to make sure we were they on day one," said Douglas. "It's the on-course experience," continued Douglas. "You don't have to pull out your phone on the course. Even the advanced hazards and mapping are enough to justify a specific golf watch over time, and I think as younger people as smartwatches become more ubiquitous." As one of the most successful Apple Watch apps out there, what has Douglas learned about the experience of making apps, and about the wearable market in general? While Douglas waxes lyrical about the future of smartwatches in golf, the development journey has been far from easy. iOS 9 and watchOS 2 colluded to bring the app to its knees for a month after Apple pulled the update and made changes. "Tizen is a big challenge and Samsung has realised that. While I'm really excited about the Gear S2, Samsung really needs to make sure they get more third party developers excited about Tizen. The trouble is a really tough platform to design for because there's no community and no documentation - it's a totally trial and error type development," he said. But it's not just watchOS and Tizen that have been hard going. While Google's ecosystem hasn't caused as many issues, the differences in quality between hardware used under-the-hood of leading Android Wear devices has been even more problematic. "We're testing automatic shot detection on Android Wear now, but the accuracy of the sensors are causing issues. For instance, the Moto 360's sensors are a lot worse than the Sony SmartWatch 3. "We want to automatically detect your swing, and to do that we use the accelerometer, gyroscope and GPS. But on some of these smartwatches, the data you can capture per millisecond isn't good enough and that makes it challenging for us. "What we're doing behind the scenes is working with the algorithms, testing - recording templates of full swing, half swing, putt - the challenge is practice swings, and working out which club you used. "The aim is to do what GameGolf does when you tap your belt, but we want to make it so a golfer doesn't need another device. They already have a watch, why can't we just leverage those sensors and automatically track your round?" But it's not just motion sensors that are lacking. 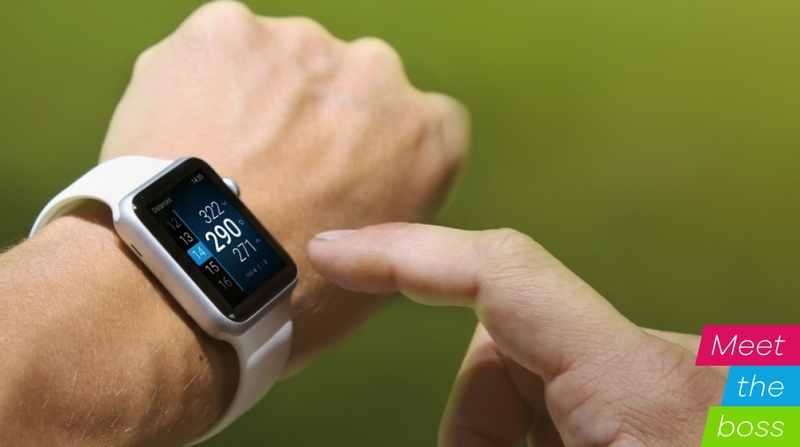 Douglas says that even the GPS of the latest smartwatches isn't reliable enough for golfers, where every yard counts. "The smartwatches' GPS is not as accurate as the phone's GPS, so we haven't leveraged it. We know it's possible, but we haven't done it yet," he said. If rumours are to believed we could get wind of the Apple Watch 2 next month at the Apple event scheduled for 14 March. So we asked Douglas which additions he'd most like to see. And surprisingly, his answer focused on the software side - something that Apple could do today if it wanted - not hardware. "I want to get access to the Siri API, for voice control. I think there's a lot of power in voice. If I can speak to my watch and say "4 iron fairway hit" before my shot, how sweet would that be? Stop pressing buttons and start using gestures. That's where it should go, and Apple knows that," Douglas said. And he wants it to be beyond shot logging and into mid-game note taking, so you can become an expert at your local course. "If I can use voice to say "next time don't take a 3 wood, lay up and go for par rather than straight for the pin" that would be awesome. It's all about software. And it's this software approach that he believes will finally be the nail in the coffin for the dedicated golf watch. "For the Garmin guys, software isn't their focus. Hardware is their focus. Obviously they have software, but third party developers are so much more creative and agile. That's why I think smartwatches will win; not because of the watches themselves, but because of the creativity of the developers." The truth is that Hole19 has to be creative. Nearly 50% of its users are in the US and UK - a number that reflects the wider golf market - and that means its users are seasonal, and they down clubs in the winter to hibernate. And that's not good for growth. "We have a challenge as golf is very seasonable. We have to make the app useful when people aren't playing golf. That's why our app is very social, we stood back and wanted to give value when people aren't playing," said Douglas. And the answer to retention may also turn the free app into a profitable one. With no premium set of features, Hole19 is looking at different ways to make money, and ones that are beneficial to its users. "You can see courses, rate them, review them and in the future, tap to book a round. It's going to be all tied into the community. On the golf course side we provide business intelligence so they can find ways to improve their yield. "I play nine holes more than I play 18, and I play before I go to work. Golf courses could leverage this information and say 'hey come play nine holes, my course is empty anyway.' We want to become a virtual golf club."